The Crescent Trail is approximately 35 miles of footpaths starting in Bushnell’s Basin on the Erie Canal, and currently ending at Northside School in northern Perinton. Planned, developed and maintained by the Crescent Trail Association, this trail is built on state, town and private lands and connects with the Canalway trail and the Trolley trail, two multiuse trails in the town. Thanks to Chuck Winship and Bob Radell and the hard work of the Springwater town Parks and Trails Committee, Springwater Trails is trying to emulate the successful Crescent Trail here in Springwater. It therefore seems appropriate that this Sunday we will hike a portion of the Crescent Trail known as Indian Hill. We will meet in Perinton at Mark and Linda’s house, 20 Black Mallard Cir, Fairport, NY, or at the Indian Hill trail head on Rt 31 east of Turk Hill Rd. Hikers who park at the house will be able to walk to the trailhead and meet the rest of the group there. After the hike, all hikers are invited back to the house for pot luck social with an opportunity to swim if it is nice and hot! Please bring a dish to pass, a beverage, or make a $5 contribution to defray costs. We will be grilling our contribution to the meal. Three hike options will be available. The climbers will follow the blue trail from the trail head south across the Jensen’s Stables farm to the high point, where we will join the main orange trail for about half a mile south on private land. This group will the retrace their steps to the high point and continue on the orange trail across open fields to a scenic view over the north east portion of Perinton. Picking up the green trail, we will head back to the yellow trail that enters the woods and returns back to the trail head and the house. The tourists will follow the same basic trail in the reverse direction. The tourists will leave the trailhead on the yellow trail, stopping at the top of Indian Hill for a view north and west. At this time of the year, the City of Rochester is behind trees, but the view north is unobstructed. This is the location of the Wegmans trail rub if you have the Perinton Trails booklet. When the yellow trail branches to the right, the tourists will pick up the blue trail across a small gully to the pond. From there it is the green trail east to the main orange trail. South on that to the high point and then back to the trail head on the blue trail. The Naturalists will start out with the tourists but will take a bit more time checking on the flora of the area (including counting the number of different spots with poison ivy). This group will follow the yellow trail from the past the Indian Hill view, and through the gully and across Jensen’s Farm. On the yellow trail next to the pond, there is an excellent crop of poison ivy growing up through a wooden boardwalk that has been abandoned by most hikers – it is probably a good idea to look at, but not walk on the boards during this hike. When the yellow trail reached the edge of the woods, the naturalists will turn left on a short green connector trail and pick up the blue trail headed back to the trail head. This hike climbs 300 feet for the climbers and about 200 ft for the naturalists, and therefore is noticeably flatter than your typical Springwater hike. If the day has been wet, hiking sticks are useful on some of the downhill slopes that can be slippery. 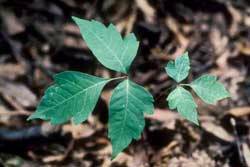 All hikers should be aware of poison ivy, although the trail is well used if you stay in the center. If you have gaiters from around your ankles, you can be safer by washing them after the hike. The trail head is 36 miles from Springwater, so carpools are recommended. Please remember that these carpools are self-organized. You need to be on time and you should leave at the designated time to reach the hike on time. Please click the links below for directions to the carpool locations. If you are coming from Dansville, Wayland or Springwater, meet at the Springwater Town Hall at 2:30 and leave promptly at 2:45 for Perinton. Hikers from Honeoye, Naples and Livonia should meet at Sandy Bottom Park on the north end of Honeoye Lake at 2:50 and leave the park promplty at 3:00 for Perinton. Dishes for the social can be left at Mark and Linda’s during the hike. All hikers parking at the house will leave promptly at 4:00 and meet hikers parking at the trail head about five minutes later. Click here for directions to the trail-head and to Mark and Linda’s. The Indian Hill trail head is located at (43.06881, -77.42591) on the south side of Rt 31 east of Turk Hill Rd. The directions below are to the trailhead on Rt 31. Please see the bottom for directions to Mark and Linda’s house. Heading east on Rt31 past Turk Hill, the road switches to two lanes at the second left Quailbush. There are 4 or 5 houses on the right side of Rt 31 after it becomes 2 lanes. Immediately past the last house, turn right into the parking area. It does come up fast and it is before Rt 31 curves to the right. From Rochester: Take I490 East to Rt 31 (Pittsford Palmyra Rd) (Do not exit at Rt 31F Fairport). Turn right from the exit onto Rt 31 and go 3.2 miles through 7 lights. You will pass Wegmans on the left between lights 3 and 4. Light 7 is Turk Hill Rd. Just past Turk Hill, the road switches to two lanes at Quailbush. There are 4 or 5 houses on the right side of Rt 31 after it becomes 2 lanes. Turn into the parking area on the right just past the last house. Honeoye and Sandy Bottom Park: Turn right coming out of the park on County Rd 36 north. Turn left at the light on US 20A. Turn right onto Co Rd 37 north. At West Bloomfield this road becomes Rt 65. Just north of W Bloomfield, stay straight on W Bloomfield Rd (CR 35) as Rt 65 curves to the left. 6.5 miles north of W Bloomfield, turn right on Rt 251 (Rush Mendon Rd). After 3.4 mi, turn left on Philips Rd. This is a sharp left just as the main road curves to the right. At the light turn right on Main St Fishers. Turn left on Rt 96, past the entrance to the thruway and by the East View Mall parking lots. Turn right on Turk Hill Rd. Turn right on Rt 31 (Pittsford Palmyra Rd) at the second light. The trailhead is 0.3miles down Rt 31 on the right. From Springwater: From the flashing light, head north on Rt 15A for 21.7 miles. About 2.8 miles north of Lima, bear a slight right toward Honeoye Falls. Curve to the right and continue onto W Main St. In Honeoye Falls, this road joins Rt 65 North. About 4 miles north of Honeoye Falls at the traffic circle take the first exit onto Rush Mendon Rd (Rt 251). Stay on 251 through Mendon Center (a flashing light). 2,5 mi past Mendon Center, turn left on Philips Rd. This is a sharp left just as the main road curves to the right. At the light turn right on Main St Fishers. Turn left on Rt 96, past the entrance to the thruway and by the East View Mall parking lots. Turn right on Turk Hill Rd. Turn right on Rt 31 (Pittsford Palmyra Rd) at the second light. The trailhead is 0.3miles down Rt 31 on the right. From Dansville and Geneseo: Take I-390 North to Exit 15 and I-590. Take exit 2 for Rt 31 toward Pittsford. Follow Rt 31 for 7.3 miles past a couple of Wegmans stores and across the canal three times, past Turk Hill Rd to the Trail Head on the right. Directions to Mark and Linda’s (20 Black Mallard Cir, Fairport, NY): All directions above approach the trail head from Turk Hill. From the intersection of Rt 31 and Turk Hill Rd, head east on Rt 31 for 0.2 miles to the second left onto Quailbush. Immediately turn right onto Black Mallard Circle. Our house is a white cape on the left 10 houses down the street. Thanks to the diligent work of Gene, and thanks to the 12 hike planners who volunteered to plan and organize a hike, the Summer schedule for Springwater Trails hiking group is complete. You can help also. I hope that each hiker will send a thank-you email to Gene. Would you like to plan a hike? Send an email to FallHikes@springwatertrails.org with your ideas. If you are having trouble thinking of a good place to hike, go to our hike history and pick one out. We will help you plan the hike by providing descriptions of old hikes, suggestions, and other support you may need. All hikes will start at 4:00PM during the months of June, July and August. Please note that locations may change due to weather, trail conditions and other events unforeseen at this time. Please check the website newsletter prior to all hikes. Download a pdf of the Springwater Trails Summer Hiking Schedule to print. (Grandparents Day) Wesley Hill S. Bristol Dena Dish to pass -Java Mama, Honeoye.